I’ve been meaning to try this yogurt everytime I wander around Whole Foods and Yes! organic market in D.C. Not only is the packaging fun, but the yogurt company uses all natural ingredients including cane juice, which is better than the yogurts which use a lot of fake sugars (yoplait, etc.). 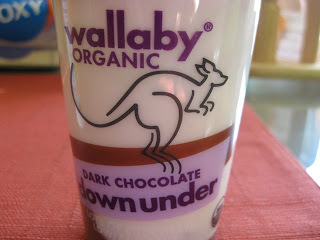 First, I dared to try the dark chocolate blend yogurt. This yogurt is SO yummy! I love that the dark chocolate mix is on the bottom of the vanilla/plain yogurt because you can blend or allocate as much chocolate as you want. It’s a tad sweeter than I would prefer, but it is a really great after dinner treat. The total calorie count for this treat is 170- not bad! Next, up is the pineapple coconut- I’m sure it will be just as delish.